I have been to an Amish funeral once, but don’t recall having this. It occurred in Ohio, though. Rebecca Miller mentions cupcakes being served in her account of an Ohio funeral. Kevin Williams notes in Amish Cooks Across America that the pie is served at weddings in some settlements in Indiana. Church traditions vary across communities. Some bakers turned it into a milky, custard-like filling, while others mimicked the texture of mincemeat. Both sticky pastes went straight into a double-crust, usually in lattice form. Despite evolving technology, Amish communities—steadfast in their devotion to tradition—have continued baking the same raisin pies well into the 21st century. Food historian William Woys Weaver discusses funeral food of the wider group of Pennsylvania Dutch extensively in his book As American as Shoofly Pie. 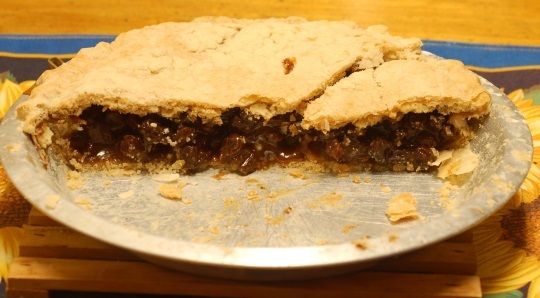 He mentions this raisin pie as well as a rice pie traditionally served at funerals by one group of Mennonites. Funeral pie is not the only traditional pie served regularly at a church event out of custom. Snitz pie is standard at the fellowship meal following Amish church service in Lancaster County. My hosts sent me home with one this past week, following Easter Sunday service at their home. I protested that I didn’t want to deprive their teenage boys of a full pie, and that just a portion would do. But what was a special treat for me was old hat for them, she explained. The boys eat it all the time. Snitz is made from dried apples. It’s one of my favorites. Below you’ll find one recipe for funeral pie, from the York Dispatch. And here’s another. And if you want to try your hand at Snitz pie, you’ll find a set of instructions here. Soak the raisins in the water for 30 minutes. Combine the sugar, flour, cinnamon and salt in a small bowl. Add to the raisins and mix. Cook over medium heat until the mixture thickens, about 8 minutes. Remove from heat and stir in the walnuts, grated lemon rind and juice. Let the raisin mixture cool until just barely warm. Pour mixture into prepared 9-inch pie shell. Add the top crust and bake at 400 degrees for 30 to 40 minutes until the crust is golden brown. 15 responses to What is Amish Funeral Pie? Recipe for Snitz Pie, Please? Would love to see the recipe for Snitz pie too. Cover dried apples with water and soak over night. Next day cook apples with water they were soaked in until soft, over low heat. Put apples through a ricer along with the juice they were cooked in. Add sugar, salt, cinnamon and lemon extract. Put in unbaked pie crust and add top crust. Bake at 425 degrees for 15 minutes, then at 375 degrees for 35 minutes or until done. It’s interesting to know the history behind this traditional Amish dessert. Although I’m not loathe to eat raisins as my adult children seem to be, I can’t say I’d be likely to call it a “favorite”. It looks (the recipe, too) rather heavy…almost somber. It seems to fit its name! I think I’ve had a custard pie with raisins, but not this one. Not sure I’d be a fan, as raisins are fine but I don’t like them that much. This custom of funeral pie is a very Pennsylvania German tradition. I was raised Penn German in a Brethren church and it’s served there. I also remember it being served at my paternal grandparents’ funerals who were of the German Reformed/UCC tradition. My mom’s variation was a sourcream raisin pie which uses ground raisins instead of stewed ones. If anyone is interested I’m more than happy to share the recipe. Please give the recipe for this pie. Hey Erik, Been wondering where you’ve been recently and was happy to see an email with a new post to read! An Amish friend who passed away recently loved raisin pie. Often times if we stopped in for a visit raisin pie was served. Now, every time I read about it, or see it, I think of Melvin. His wife just uses stewed raisins for the pie. I found a recipe for a raisin custard pie, made it, and took it along when visiting Melvin and his wife. It was good, but only made it that one time. The sour cream raisin pie recipe can vary from a baked pie or a cooked custard that is poured into a baked crust and meringue put on top. How about “Funeral Cake”? Chocolate Chip Date Cake is the recipe we use. Years ago for Mothers Day the local newspaper ran stories and tributes to certain moms. A daughter told the story about her mom that as soon as she got word of a funeral she made that cake..hence the name. So, in our cookbook the recipe went with the title Funeral Cake. What fun to talk about traditions from different people and parts of the country! a filling that some called “funeral spread” which was made with ground ham or bologna, mayonnaise and pickle relish, served on rolls. My grandfather’s parents spoke only Penn Dutch. This recipe has been handed down to family members. I was surprised when I read the recipe here. It didn’t have real tomatoes in it and used on pancakes! We’ve always used plain bread as the base, but I think the next time I make it, I will use it on pancakes. Not much difference except in preparing. So, I found a new recipe for raisin walnut pie today! I made it this aft, and the Mrs and I just had to have a taste of it, and thought I better share the good news! Beat the eggs and add the rest of the ingredients. Pour into the pie shell and bake at 425 for 10 minutes. Reduce heat to 350 and bake an additional 30-35 minutes, or until a knife inserted 1 inch from the edge comes out clean. (Center will be slightly soft, but will set up as it cools.) Serve with whipped cream if desired. It was just slightly warm when we dug into it and oh my it was gooey delicious! This was way better than the Amish raisin pie I’ve eaten in the past. Give it a try and enjoy! Looks delicious (except I’m allergic to cinnamon). Leave a reply to What is Amish Funeral Pie?